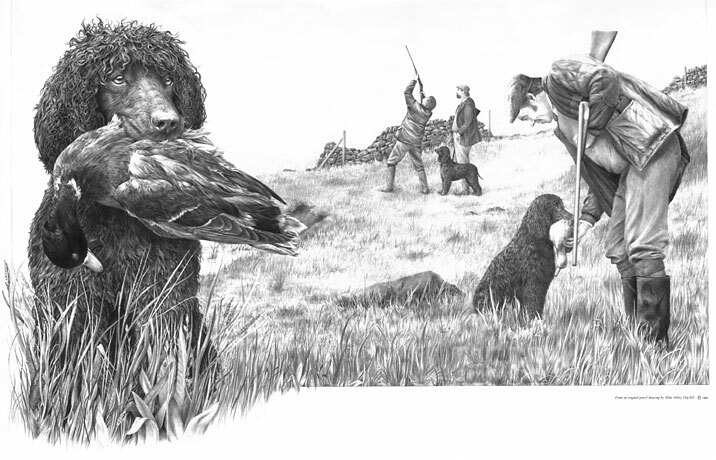 Due to the success of the first print that I produced for the Irish Water Spaniel Club of Great Britain (it sold out in 3½ hours) I was asked to release another print the following year. The Club's membership is approximately split into three camps - one third show, one third work their dogs and the remaining third both show and work. This time the brief was to please the many working-dog members and the drawing was composed accordingly. At the close of that year just six of the 110 prints and 20 Artists Proofs remained available - the edition sold out soon after. The original drawing took 118 hours 46 minutes to complete and is now in a private collection in England. image : 18" × 12½"